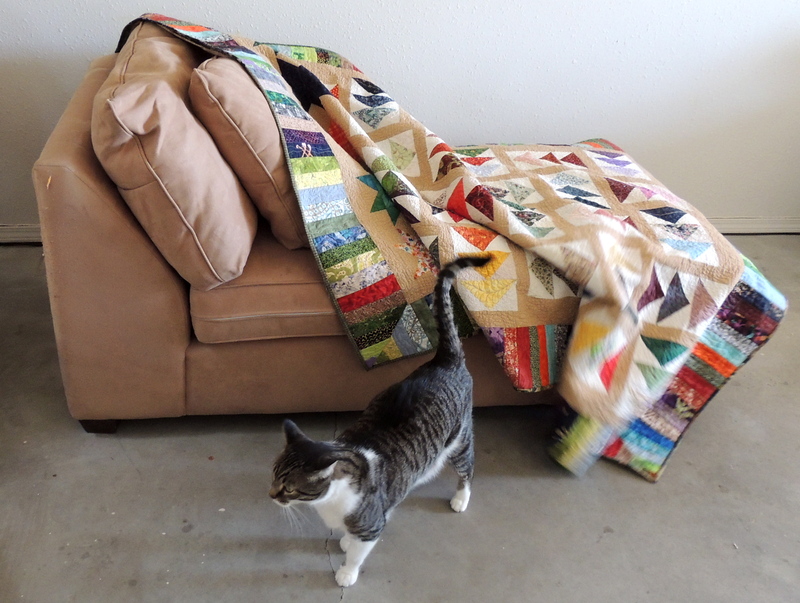 My quilt, Finding My Way, is done and already doing duty on the chaise in my studio on a surprisingly cold day in May–it was 30 degrees outside this morning. 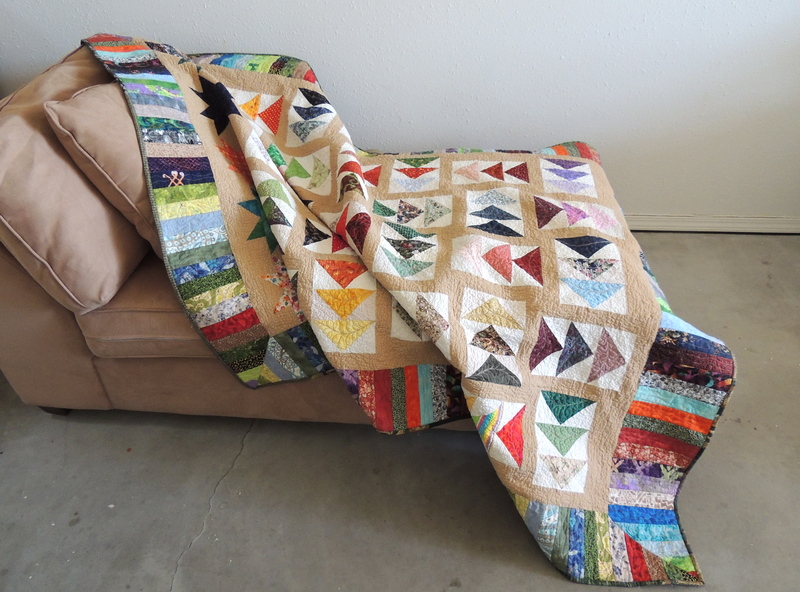 This quilt began as a set of scrappy flying geese units from an exchange. The setting is similar to the Jeweled Geese blocks we made in March 2009, which was inspired by an antique quilt in the Sherburne Museum collection made from silk ties. 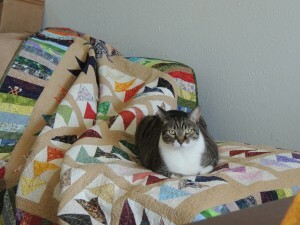 (You can see a photo of the silk tie quilt here). For this quilt, I went back and added more quilting to the borders after the quilted-but-not-bound quilt had gone through the washer and dryer and it was clear it needed more quilting to match the density of the interior. After another trip through the washer and dryer, it was flat. Even though this quilt is for me and will probably live in the studio, I’m so happy I was able to quilt it out. There are at least 200 different fabrics in this quilt. Each of the 90 geese fabrics is unique as are most of the backgrounds on each of the 90 flying geese unit. There are 40 different fabrics in the pieced borders–you can see the uncut made border fabric on my blog here. 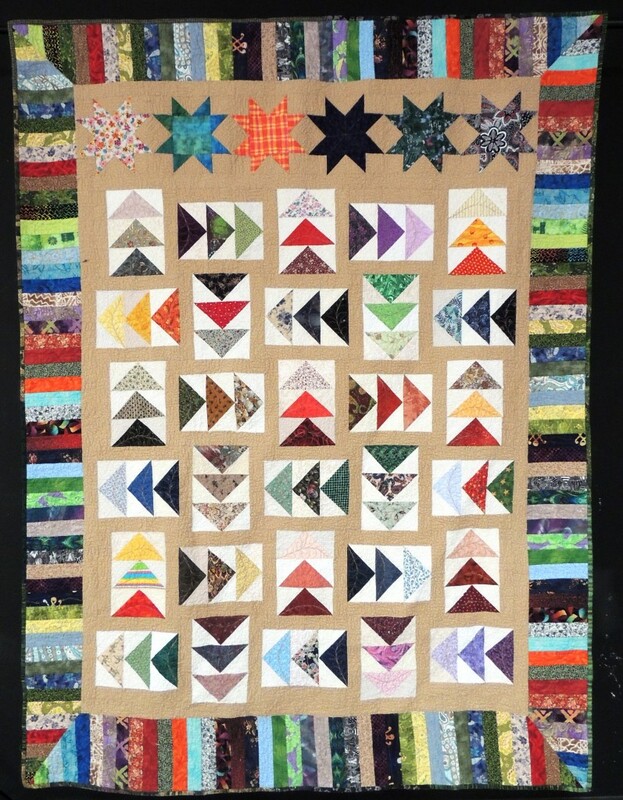 Add 8 more fabrics for the stars–another block we’ve made for the Block Lotto (a couple times) and 8 more green fabrics for the binding. Although I love the scrappy homeyness of this quilt, I think it could be fun to make it from a couple of pre-cut layer cakes from a specific designer/fabric line. I wanted to share some quick snaps before I send it through the washer/dryer a second time to see if the additional quilting in the borders might encourage some more crinkle and less wave. There was the usual cat photo bombing … and the ceremonial claiming of the new quilt.